We had our first bitter cold day in Wisconsin a few weeks ago, and I was able to break out my puffer vest and over-the-knee boots for a day of shopping. I wore these boots all day, and they were so comfortable and warm! I love them! My favorite item to wear when shopping is a puffer vest. It is just perfect for running from a car to a building. I also don't get too over-heated inside a store wearing a puffer vest verses a winter coat. I wore a off-white sweater underneath the vest (I bought it last year, but it's still available at JCPenney), and accessorized with a blanket scarf and hat. I love that it's winter and I can wear all my knitwear again. I don't have to worry if I'm having a bad hair day; I just pop on a beanie and go! I picked up the puffer vest last year at Old Navy...and they still have them! You can sometimes pick one up for $15.00 on sale. My embroidered jeans are new this year from JCPenney. The OTK boots are also new, they are from AGACI. I purchased them in-store. They are not available on-line. I carried a burgundy bag to compliment the burgundy vest. And, because so many of you love to see how I wore items in previous ways, here is that same off-white sweater styled with brown jeans and a brocade scarf. 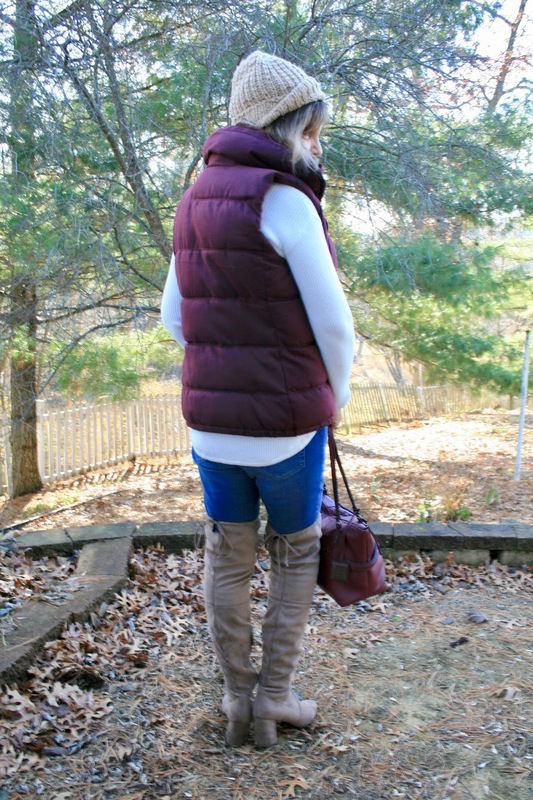 And here are two other ways I wore my puffer vest. And with a plaid shirt and grey jeans. Next week Monday is my next "Grandma and Me" post! I have some very special Grandma and Me" Christmas outfits to share with you. Love all of these looks, the pieces are all so versatile! I love all the layers and the color of this puffer vest! This vest is such a pretty fall color and it really compliments the colors in that scarf well! I just got some OTK boots, I am excited to wear them this weekend. I really like the outfit with the vest again and the graphic sweatshirt! Thanks Carrie! I can't wait to see your OTK boots! Ok, I need to go get that vest at Old Navy. I tried it on early in November but didn't buy it...was waiting til payday. Love how you have styled it. And you are right, puffer vests are perfect for dashing in and out of buildings and between stores. Thanks Leslie! 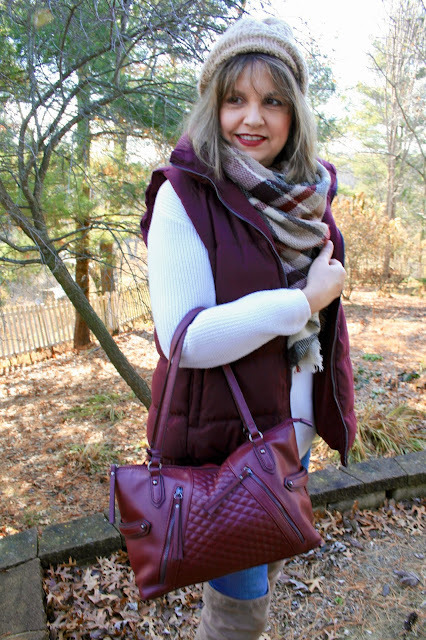 I love my vest and grab it more in the winter than any other winter coat! What a fun winter look, love the color of the vest and how perfectly the boots and hat colors match. This is such a cute winter look! I love the color of your vest and how you paired it with the boots and beanie! Hope you are having a lovely weekend! We've put our Christmas tree up and gone to a few Christmas events this weekend. So far, it's been a good one and the predicted wild weather hasn't hit yet which is nice! Thanks Mica! Yes, we had a nice weekend. We went to a nearby city to see a Christmas Light Display. I love all of these looks, Amy! I think the very first one with the puffer vest is my favorite. That looks like something I would wear! Thanks for linking up! This vest is something that is so practical, yet you've made it so stylish too!! I love all the outfits as usual!! Thanks Jodie! Practical but stylish is my moto! I love puffer vests! With all the right accessories like in your outfit it really is super warm without a jacket! I actually got a pink one this year and have been reaching for it so often! Thanks Kristin! I love your pink puffer vest! 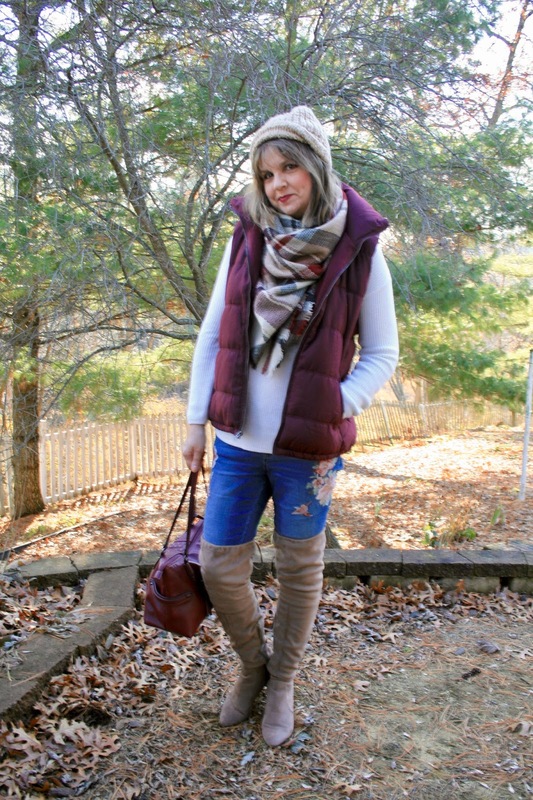 That puffer vest is really cute and I LOVE the colors in your scarf! love the puffer vest on you Amy! The color looks great and the layering with the otk boots in taupe is so put together. love it with winter white! I love that first outfit. So cute and cozy and something I'd wear. I totally love vests for those reasons you mentioned too. Also, I didn't know you do a linkup on Mondays now. How fun! Can I linkup anything?! Thanks Ada, I actually decided to discontinue the link ups due to some issues I've been having. I didn't realize I still had it mentioned on this post, I will edit it now.